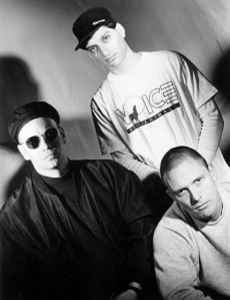 Politically active band that combined confrontational left-wing politics with self-deprecating humour and a sound that encompassed elements of hip-hop, hard rock, funk, industrial and dance music. Hugely influential band when I was in college that really helped shape much of my life. Because of them, I embraced vegetarianism starting in 1992, I became a very active member of the political Left, and I stand up proudly in defense of women and minorities. I was lucky to see them live twice and I always enjoy revisiting their many albums and singles (ALL of which I own) often. Early 90's "white guys doing industrial hip hop" act in the vein of Meat Beat Manifesto that I recently revisited to do a "retro check" and I'm sad to say that it's aged about as well as George Bush the Elder references. The beats actually still sound good to my ears but the lyrics are rather trite "Freshman Sociology 101" social-justice left-wing silliness that might have been somewhat edgy in 1991, but considering every yokel in flyover country now blindly regurgitates the same sort of Marxist worldview it really accentuates the "time warp" sort of feel to this group. Nevertheless, it is good to revisit these sorts of artifacts from one's youth (if only ultra-periodically) to see what exactly has changed, but overall it just seems to me that early 90's industrial/dance/EBM stuff is batting nearly .000 in the longevity department.